Lumia, Lumia, Lumia! That seems to be all the talk of late surrounding Windows Phone in general, whether it's good or bad news. On one hand, AT&T recently introduced two brand spanking new Windows Phones, and on the other with Verizon, they’re still sitting it pretty with a single one in the aging HTC Trophy. Although it’s far from being the most renowned Windows Phone out there, Big Red’s sole Windows Phone is about to get yet another software update – one that’s speculated in bringing along the 8107 build. Granted that the 2305.13.20402.605 software update doesn’t mention the specifics regarding which build we’ll be seeing, the changelog mentions that it’ll be getting the usual set of enhancements and improvements. 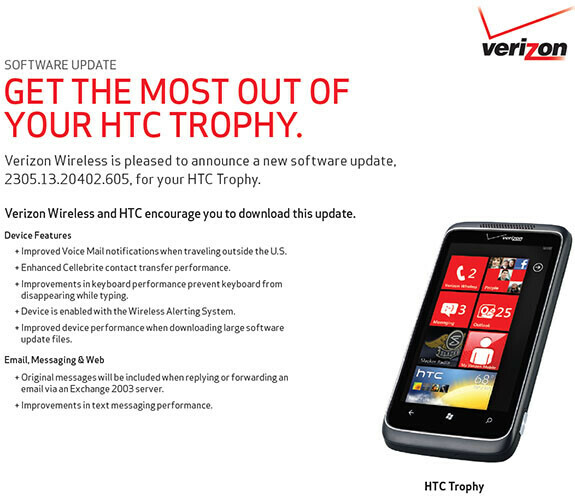 Specifically, the Trophy will be seeing an improvement in the keyboard that will prevent the on-screen QWERTY from disappearing while typing, improvements to the Voice Mail notifications when traveling outside the US, enhanced Cellbrite address book transfer performance, enabling the handset for the Wireless Alerting System, and better performance when downloading large software update files. So far, there’s no exact time frame on when it’ll be pushed out, but seeing that the information about the eventual update is online, we can expect to see it very shortly. Therefore, for any of you HTC Trophy owners out there, just keep an eye out for that notification. 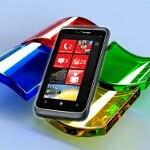 Its a shame the Vzw and sprint are not stepping up to get new windows phones. Although I am an Android user, I really like the windows phone platform. I like my Samsung focus alot. Sweet, will try to keep a lookout for this update. Was wondering if we would ever get it, since most carriers haven't felt the need to be prompt about getting this one out. On that note, I really like the idea of getting updates from Microsoft directly rather than through the carriers. They put so much work into making sure that all of their phones are running on the same OS builds, but they leave it up to the carriers to test and decide when it goes out. You have to be on the carriers' a--es Microsoft, otherwise they will take their sweet time doing any testing! No, it won't bring LTE. The HTC Trophy doesn't have an LTE chip, so no software update could enable LTE.